Well, there I go again. Talking about another neck pickup. Haha! I don’t know about you guys, but I find the neck position to be a vital and versatile component. 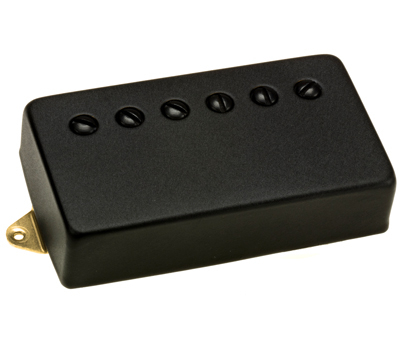 The DiMarzio EJ Custom Neck humbucker is a pickup that really wears many hats. Made for Texas guitarist Eric Johnson, the EJ Custom Neck is part of a set originally intended for a 1959 reissue Les Paul. Eric Johnson is know for having ears capable of being able to tell what battery is in his stomp boxes. A pal of mine suggested he thought it might be an urban legend until he witnessed Eric at a sound check, telling his tech that it sounded like the wrong speaker cable was used for one of his cabs. And Eric was right. For this review, I used the same guitar that tested the DiMarzio Bluesbucker neck pickup. It’s paired up with the same DiMarzio PAF Pro in the bridge position. The EJ Custom Neck comes in just about all the available colors or with a selection of covers. I kept it real with open coils and black bobbins. It is wired to a push-pull pot for series-parallel. Right out of the gate, it was a bit different than what I was expecting. I seemed to remember reading where some players found it really bright. That had me expecting a thinner voice. Not so. The EJ Custom Neck has a more colorful palette at work. Starting with a clean amp tone, I found that the pickup in full series mode is very well suited to handling most any clean style. Strumming chords, single note lines, funky comping, and dynamic jazzy chordings. Very dynamic and full range. Couldn’t push it to break up, even when I tried…which is a trait I was hoping to find. Sliding over to a dirty amp tone, the EJ Custom Neck is great at handling the high gain that I run. No boom or flab in the low end, but still bigger than punchier. Highs were closer to being sweet. And like many of the DiMarzio neck option, I found the mid-range lead work to avoid that nasal wonky character that some neck humbuckers can have. The pickup is considered vintage output, but I found it most capable of sustain that would make some more aggressive pickups jealous. Something that trips me out about the pickup, is how it responds to being in parallel mode. Sure, there’s a difference. But… the EJ Custom Neck retains a bit of the series vibe in parallel mode than I’ve seen in other pickups. For example, on a clean amp setting, it eases up a bit while still having plenty of presence. It’s a neat quality and a pleasant surprise when looking for something just a bit different.